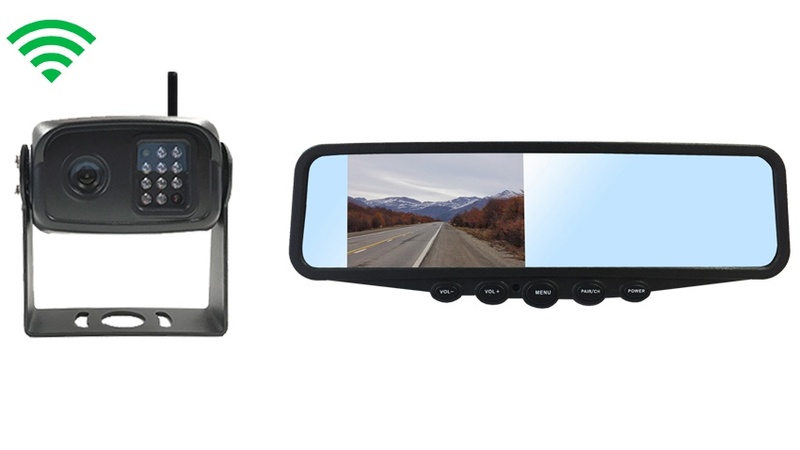 The crystal clear 4.3” LCD Mirror Monitor is a perfect addition to any driver that needs assistance backing up. You also have 2 inputs so you can connect more than 1 camera. See the whole world behind you in rich colors. The Mirror doubles as a regular mirror, when the camera is off, and a monitor (4.3” viewable) when the camera is on. Remember, even when the camera is on you can still use the parts of the mirror section that remain a mirror. This mirror monitor is compatible with all our built in wireless cameras which means all the wireless parts are built into the unit. This is also compatible with any car; it connects to any power source or a cigarette lighter. This mirror mounts by clamping on your current mirror and the clamps are adjustable so it will fit all cars. The mirror also has an auto dimming feature. When installing the mirror it fits right into the spot your current mirrors rests. The Digital Wireless rear view RV Box camera with built in antenna Has a 120° Degree viewable angle, its waterproof and has auto night vision. The camera is one of the most durable we have, with incredible adjustability and night vision clarity. The RV Box camera has a metal sun shield visor to protect you from glare and pebbles. This is by far our toughest built camera. It has been regularly used in cars, vans, buses and even industrial sized caterpillar trucks, operated in the harsh oil sand of Canada. This camera can take a direct hit from a rock and it will still work like new. It has also been very popular with RVs, Trailers & Fifth Wheel because its housing allows you to install the cameras on multiple sides of your vehicle. This camera is also a wireless camera so there is no need to run cables through your Car or RV. TadiBrothers only sells one type of wireless camera because its the ONLY one on the market that is a reliable rearview backup camera. This Digital Wireless Rear View Camera System has a flawless range of 150ft+ (when we tested it in open space we have seen a range of 215ft). This Digital camera is compatible with any of our digital monitor. It is 100% weather, water, and mud proof. It is extremely durable and has been tested and consistently used in the harshest environments. Put any compatibility issues aside. With the TadiBrothers promise, you have our 30 day guarantee to return the item for an exchange or a full refund.
" After making two purchases on eBay which ended in disaster, I decided to splurge and buy one of the Tadibrothers systems. I decided to go with this camera because I heard from a lot of people that you need a long bracket and this was a long you bracket on the camera according to the measurements. When I got it I hooked it up and it worked great the reception on the digital camera was amazing the pairing was simple and to the point I just pushed a button on the camera and a button on the monitor and the pier in few seconds. I have to admit that while installing it I dropped it thinking that that would be the end of the camera, but it still worked perfectly it is a testament to the quality of the product I’ve already been through a few rough weather patches and the image is solid every time I’m one of those very particular people that like to leave the camera on while we’re even parked to see what is going on and it works great especially the night vision. I with the camera was little less expensive but considering the junk I purchased elsewhere Tadi delivered versed on quality and value!" RV camera with furrion mount.
" I needed a two camera system for my fifth wheel and I decided that this camera would be perfect for the back of my trailer. I had a furrion mount and I wasn’t sure how to install, I called up Tadibrothers and they actually told me that with my camera I should’ve purchased their furrion adapter. The customer service agent was nice enough to sell me the adapter and ship it to me for free. It made a huge difference in the installation I got the camera mounted in 10 minutes thanks to the mount and the cable that came with it. The camera has execlent day and night time picture and I love the long u bracket it comes with. It lets me pivot the camera so it point right behind me. " "This camera worked great out of the box. I love using it while driving down the road it keeps my trailer safe. Our use it on a 70 foot distance and we drive a lot throughout the year. The camera has held up in the weather great for the last four months and I wanted to just tell everyone that I am satisfied with this camera. Are you a week ago I added a license camera to this monit this camera worked great out of the box. I love using it while driving down the road it keeps my trailer safe. Our use it on a 70 foot distance and we drive a lot throughout the year. The camera has held up in the weather great for the last four months and I wanted to just tell everyone that I am satisfied with this camera and it’s performance. " "For me, this is the best quality I've ever had for a backup camera. Solid built that you can feel. A great, reliable picture in color. Does not cut in and out but steady picture as if it were hardwired. Outstanding clarity by day and night. Recommended!"